For the metropolitan area surrounding the city of Kiev, see Kiev metropolitan area. Line 4 from Vokzalna to Raiduzhna is under construction, as well as an extension of Line 2. Telychka and Lvivska Brama on line 3 are "phantom" stations (see article). The proposed Livoberezhna Line is not shown. The Kiev Metro (Ukrainian: Ки́ївський метрополіте́н, translit. Kyjivskyj metropoliten, IPA: [ˈkɪjiu̯sʲkɪj mɛtrɔpɔlʲiˈtɛn]) is a rapid transit system that is the mainstay of Kiev's public transport. It was the first rapid transit system in Ukraine and the third system in the Soviet Union, after Moscow and St. Petersburg. It has three lines with a total length of 67.56 kilometers (41.98 mi) and 52 stations. The system carries 1.331 million passengers daily (2015), accounting for 46.7% of Kiev's public transport load (as of 2014). In 2016, the metro carried 484.56 million passengers. The deepest station in the world, Arsenalna (at 105.5 m or 346.1 ft), is found on the system. The first idea for an underground railway appeared in 1884. The project, which was given for analysis to the city council by the director of the Southwestern railways, Dmytro Andrievskiy, planned to create underground tunnels from Kyiv's railway station. The tunnel was expected to start near Poshtova square and finish near Bessarabka. A new railway station was to be built there, while the old railway station was to be converted into a freight railway station. The project was long discussed, but finally turned down by the city council. The development has been lately going in fast pace, not only when talking about population growth, but as well while talking about the development of the trade and industry businesses. 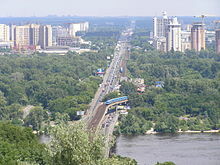 The specifics of Kiev, namely: the distance between the residential districts from the central business district, an insane price of the apartments in the centre and its neighbourhoods, the elongation and hilly position of the city, a predominantly commercial habit of its inhabitants - all those factors make the question of cheap, fast and safe transportation arise. The Kiev city tram can't answer any of the issues. The tram's drawbacks are widely known, and the reasons they appear is that, in the given conditions, the tram network development is not able to keep pace with the fast-growing city. An increase in rolling stock on the main lines may cause a slowdown in the street movement, while an increase of speed threatens the safety of people. The only way out of the situation is the transfer from on-ground trams to underground trams, starting from the main streets. Despite the arguments, the project, again, was not accepted in the city council. However, after the downfall of the Hetmanate in the autumn of 1918 and the change of the Ukrainian government towards the Directorate the project lost its support, and, in 1919–1920, Ukraine plunged into chaos of occupation by Communist Russia and the project was shelved for good. Following the Bolsheviks' victory in the Russian Civil War, Kiev became only a provincial city, and no large-scale proposals to improve the city were drawn. Everything changed in 1934, when the capital of the Ukrainian SSR was moved from Kharkiv to Kyiv. On July 9, 1936, the Presidium of the Kiev City Council assessed the diploma project by Papazov (Papazian), an Armenian graduate of the Moscow University of Transport Engineering, called, "The Project of the Kiev Metro." The meeting minutes stated that, "the author successfully resolved one of the problems of reconstruction of the city of Kiev and establishment of intra-city transportation and also answered various practical questions pertaining to the Metro plan (the routes of the underground, the position of stations)." The engineer Papazov (Papazian) received a bonus of 1,000 rubles for this project from the City of Kiev. Nobody knows, however, if his proposals were taken into account of the plan. A few days before, on July 5, the Kiev's "Bil'shovyk" newspaper published an article which featured a project of an underground, prepared by the engineers from the Transport Devices Institute in the Ukraine's Soviet Socialist Republic's Academy of Sciences. The project promised to drill three lines of a subway ca. 50 km long. Rumours started spreading that the construction of the Metro would kick off soon. The city council denied it amid letters from the specialists in the drilling and mining sectors offering their services, at first. In 1938, however, the officials started preparatory work, which finished abruptly with the advent of war, in 1941. Kiev was terribly destroyed during World War II, so a massive reconstruction process was ordered in the third largest city of the USSR. This time, the Metro was taken into account. Work continued in 1944, after Kiev's liberation. On 5 August 1944 a resolution from the Soviet Union's Government was proclaimed. The resolution planned the underground construction, thus the government ordered the appropriate organisations to continue preparatory works, create the technical project and the estimated price of the project so as to give the government the whole documentation and to start government debates already in Q4 1944, to introduce this on the task list. For this purpose, the USSR's National Commisariate of Finances allocated 1 million rubles from the Reserve Fund of the USSR's government to continue works. On 22 February 1945, another resolution was claimed, which definitely ordered the underground to be constructed. To let the government know where the underground construction was most suitable, experts from the Kiev office of "Metrogiprotrans" analysed the flow of passengers in the streets of Kiev, not only in the centre, but as well on the outskirts. 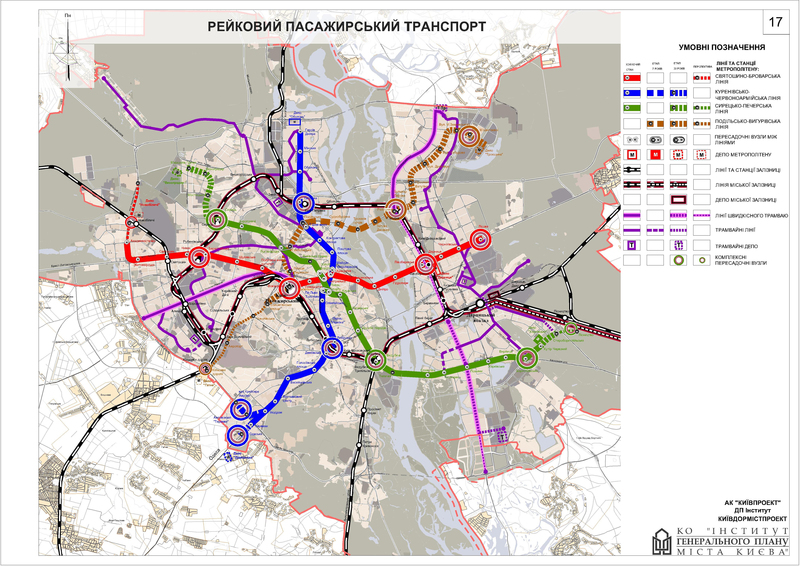 The analysis revealed that the three suitable directions to construct the underground: Sviatoshyn–Brovary, Kurenivka–Demiyivka and Syrets–Pechersk, out of which the former two were chosen to be built in the plan. It was decided that the first round of underground openings on the former two directions, 30.4 km in length, would have to be constructed by 1950. The plan, however, did not come into life. The final preparations were conducted in 1949. Then, according to the decision of the Ministry of Communication, "Kyivmetrobud" enterprise was created on 14 April. Only then the underground construction started. Construction finally kicked off in August 1949. The initial plan had 7 stations and the project designs competition for the stations was announced in 1952. The commission for the competition wanted that the style be Stalinist, i.e. richly decorated stations, with plenty of Communist symbols and as well national (Ukrainian) motifs for all 7 stations. However, the competition was cancelled—partly due to the cancellation of the two westernmost stations and partly due to Khrushchev Thaw, which made the Stalinist style inappropriate. Tunnel drilling met with frequent difficulties that were not mentioned in the project, for example: a specific terrain of drilling and the underground water sources which were not expected. For these reasons, the construction fell severely behind schedule. The first connection between separate tunnels was made between "Dnipro" and "Arsenalna" in December 1951, while the last were created between the "Vokzalna" and "Universytet" stations, in May 1959. Various difficulties arose at the construction of the underground. For example, Arsenalna station was constantly flooded by underground waters, which was one of the reasons behind its depth and its design, which was difficult to execute. Moreover, works came to a standstill in 1954 when all funding which had been planned to spend on underground construction, was in fact allocated to treat the previously unused lands fit for agriculture. In spite of it, works progressed. Earlier stations are ornately decorated and many have impressive vestibules, such as this at Vokzalna station. At the beginning of 1958, a competition for the best design of stations was announced, therefore, a commission analysing the works was created out of activists, experts from engineering and architecture of both Ukrainian SSR and USSR, sculptors, artists, writers and heads of Glavtunelstroy, Metrogiprotrans and Kyivmetrobud. In July, an exhibition of 80 works was organised. Five of the best works were used for creating the design of the first five stations of the Kiev underground: "Vokzalna", "Universytet", "Khreshchatyk", "Arsenalna" and "Dnipro". For the project to come into life, 660,400 m3 (23,321,805.9 cu ft) of concrete (reinforced as well as traditional) were poured, additional 7,300 m2 (78,576.5 sq ft) of granite and marble were used to decorate the station. On 22 October 1960, trains delivered, the motorman of the Moscow underground, Alexey Semagin and Kiev's Ivan Vynogradov, former train operator from Kiev-Pasazhyrskyi, the central railway station, made a test run. The former was driving, while the latter was Semagin's assistant. At last, on the anniversary of the October Revolution, on 6 November 1960, the five stations that now form the central part of what is today known as the Sviatoshynsko-Brovarska Line, which runs from the west to the east of the city, were opened. That day, the motormen changed their places, thus Ivan Vynogragov is now deemed as the first motorman of the Kiev's underground. The underground was not given to the public the same day the line was declared opened. During the first week, special passes had to be shown to ride the newly opened section. Public service only started on 13 November that year. Immediately after the underground's opening, a problem with the train depot arouse. It was at first solved by creating a temporary depot next to "Dnipro" station, where Kyivmetrobud had its headquarters at the time. It contained some space so that two trains could be repaired, the repair room itself and the headquarters. There were some warehouses constructed as well, so that necessary items could be substituted if needed. Unfortunately, the depot was not connected to the main underground line, so that it was not able to execute its functions properly. To move trains to the depot, an overhead crane was used. At the time, the line was served by type Д underground trains (produced by Metrowagonmash). The logistics problem appeared at the time, since there was no connection between the underground and the railway. In order to deliver them to the system, trains from Mytishchi arrived on Darnytsia railway station, to be then placed on a special carriage. The carriage was then transported by trams to the temporary depot (via the now non-existing tram line along Dnieper), where the railway turntable, after being set so that the tracks of the turntable were parallel with those on the station, lifted them there. Since the procedure was uncomfortable and tedious to do, the majority of trains rested overnight in the tunnels and arrived into the depot only to be checked for repairs and repaired. The creation of such a depot was a temporary event, not only because of the difficulties connected with it, but as well since it was the only place where it could have been placed (there was no possibility to construct a permanent on-ground depot as the stations were deep underground), while a creation of an underground depot was costly and could not have guaranteed a connection with the railway system, unless another tunnel was created to supply the trains. At the time, the underground was under the jurisdiction of the USSR's Ministry of Communication and not of the Kyiv's city council. Moreover, there were no turnstiles, so, as it is today practised on Kyiv's buses, the tickets were shown to the inspector. Moreover, the motormen, until 1962, were mostly from Moscow, as there was no institution that provided appropriate education in Ukraine. There were some railway engineers employed at first from Kiev, such as one that opened the underground, even though they had to qualify for motormen in Moscow. The second section's construction of the (as then) the only line in Kyiv started in 1960 at latest, and finished on 5 November 1963, with the opening of a 3.4 km section of the underground, with two stations: "Politekhnichnyi Instytut" and "Zavod Bilshovyk" (now "Shuliavska" station). A year later, new type E underground trains were introduced. View of the left bank surface extension of the metro's Line 1. Later on, the line crossed the Dnieper river in 1965 across newly constructed Metro and Rusanivskyi bridges and went east to the large residential areas being built on the left bank of the river. As the "Dnipro" station, "Hidropark", "Livoberezhna" and "Darnytsia" stations all were on-ground. Additionally, to resolve the question of a temporary depot, a permanent one, "Darnytsia" with the access to railway, namely, to Kyiv-Dniprovskyi railway station, was built between "Livoberezhna" and "Darnytsia". Thanks to the depot, new trains could be easily transported immediately into the depot, which, having a connection with the metro line, could now easily host trains. Besides, a few developments were made on the old stations. Khreshchatyk station was opened with one exit only, while the second way out was built from summer 1960 until 4 September 1965, when it was opened. While being modernised, the station became longer by 40 metres. The third and last exit from Khreshchatyk was finished in May 1970. Further extension of the line to the east was made in 1968, when "Komsomolska" station was opened (now "Chenihivska" station) with another facility where the trains could be mended. When it revealed that the Leningrad's Metro type E underground trains were not suitable for the platform screen doors stations that were then massively built at the time, they were delivered to Kyiv in 1969, while the older type Д underground trains, which did not feature any problems with similar stations, were transported to Leningrad. A type E-zh train on the metro's Line 1. The following year, all the trains were added an additional carriage, so that each train could then carry 4 wagons at once, with the fifth added two years later. From 1972, the number of carriages that each train rides with remains constant up to now (as of 4 July 2017). On 5 November 1971, Kyiv's then westernmost neighbourhoods were connected to the underground. 3 stations: "Zhovtneva" (now "Beresteiska"), "Nyvky" and "Sviatoshyno" (now with "o" removed) were then opened to public. Thus, the underground was extended to 14 stations and 18.2 km. On 23 August 1972, the billionth passenger of the Kyiv underground entered the "Arsenalna" station. The worker of the "Arsenal" factory was given a yearly ticket in the underground as a present on such an occasion. Finally, in 1973/1974, another modernization of the underground was made, the third one in the rolling stock. New trains from Leningrad's train building facility were delivered to Kyiv, namely the type Eм underground trains. Further extensions on this line which will be mentioned later, appeared in 1978 ("Pionerska" station, now "Lisova") and 2003 ("Zhytomyrska" and "Akademmistechko"). Construction of the second line began in 1971. The line became known as "Kurenivsko-Chervonoarmiyska" however the name did not completely correspond to the actual route, as it does not pass via Kurenivka. In mid-1960, when plans about the line were made, the construction was expected to go towards Kurenivka and Priorka, with "Zavodska" station instead of today's "Tarasa Shevchenka" one "Petropavlivska" station at near Kurenivskyi park and "Shevhenka Square" under the identically named square. However, as the decision to create the Obolon residential district was made, the first plans were changed. The new line was openly constructed and the stations were not constructed deep in the ground. The consequences were grave for Podil because historical buildings were demolished. On the other hand, archaeologists discovered a ca. 600–700 m2 (6,458.3–7,534.7 sq ft) house from Kievan Rus' times under the Red Square (now Kontraktova Square). The discovery helped historians know the life of Podil inhabitants in the Middle Ages to a much more profound scale. The archaeological research was one of the reasons the underground construction was suspended, which is why a small 2.32 km (1.44 mi) stretch was opened only on 17 December 1976. It contained three stations: "Kalinina Square" (the station's name changed on 17 Oct 1977 because of the 60th anniversary of the October Revolution upcoming to "October Revolution Square" ("Ploshcha Zhovtnevoi Revolutsii"), now "Maidan Nezalezhnosti"), "Poshtova Ploshcha" and "Chervona Ploshcha", with the repairing facility near the last of those mentioned and the transfer corridor to the older line, separate for trains and for passengers, which allowed the exchange of rolling stock, and, more importantly, which created the access for trains on the new line to "Darnytsia" depot, until a new one appeared in 1988. Heroiv Dnipra station, built as part of the second line. Simultaneously, an extension on the older line was made eastwards. In 1978, "Pionerska" station was opened, which might have been the next step towards the realization of Stalin times projects (the line was planned to be extended to Brovary, the Satellite town of Kyiv). Nevertheless, works on that line came to a halt, and, as of 4 July 2017, there were no plans yet to extend the line eastwards beyond "Lisova" station, so the main work on line construction was shifted to the line M2. What became known as the Kurenivsko-Chervonoarmiyska line (today the Obolonsko–Teremkivska line) continued expanding. On 19 December 1980 three new stations—"Tarasa Shevchenka", "Petrivka" (now "Pochaina") and "Prospekt Korniychuka" (now "Obolon")—were opened in the northern part of the line. After another two years, "Minska" and "Heroiv Dnipra" stations were added to the second line, on the 55th anniversary of the October Revolution. Therefore, the then largest residential district of Kyiv was connected to the rapid transit network. Building processes did not stop at the southern end of the line: on 19 December 1981, "Ploshcha Lva Tolstoho" and "Respublikanskyi stadion" (now "Olimpiiska" station) were given to use, with "Chervonoarmiiska" (now "Palats "Ukrayina"" station) and "Dzerzhynska" (now "Lybidska" station) following suit on 30 December 1984. Construction then started to the south-west of the newly opened terminus, but shortly afterwards interrupted by the accident, when the workers were drilling through the difficult terrain under the Lybid river. For that reason, any further works continued only 21 years later, in summer 2005. While the construction of the M2 underground line was at its apogee, in 1980, new rolling stock from Metrowagonmash (81-717/714) started its usage. In 1985, a new train repair plant was built, first called ОМ-2. Moreover, after it appeared that the corridor between "October Revolution Square" and "Khreshchatyk" was not able to cope with the stream of passengers, a second corridor was built, called informally "long" corridor, and opened on 3 December 1986. The same year, a disambiguation to the Darnytsia depot was made (3 tracks are made, of which 2 are for passenger traffic, while the third is supposed to let the trains exit the depot. On 30 December 1987, the second (eastern) exit from the "Hidropark" station was erected, opened only in summer. Finally, on 19 March 1988, a new depot (called "Obolon"), serving line M2, was created. Zoloti Vorota station incorporates a very distinctive Ukrainian theme in its design. The aluminium construction of Pivdennyi bridge, proven useless against precipitation, can be seen on the bottom left. The first event connected with the third line construction was, in fact, the creation of a new tube on the line M1 between "Vokzalna" and "Khreshchatyk" stations. In the middle of it, a new station, "Leninska", was to arise, specially designed as a transfer hub to the future line M3. When the new tunnel was already constructed, and the only thing to do was to connect the new tunnel to the rest of the line, the line was cut into three parts: from 31 March to 1 October 1987, trains rode from "Sviatoshyno" to "Vokzalna" and from "Khreshchatyk" to "Pionerska" stations as usual, while, in the old tunnel, two shuttle trains were carrying passengers from "Vokzalna" to "Universytet" stations. The tunnel between "Khreshchatyk" and "Universytet" was closed. In order to cope with passengers, additional temporary lines of buses and trolleybuses were created. The station itself was inaugurated on the 70th anniversary of the October Revolution, on 6 November 1987. The older tunnels, over 300 m each, partially cut by the ceiling of the "Zoloti Vorota" station, still exist and are now accessible only for underground staff in the case when the tunnel is taken care of. The third line's construction (called Syretsko-Pecherska Line, the northwest-southeast axis) started in 1981, but finished only on 31 December 1989, when a 2,1 km segment, featuring 3 stations ("Zoloti vorota", "Palats sportu" and "Mechnikova" (now "Klovska")), the first two being the transfer hubs to other lines, while a technical tunnel between lines M2 and M3 started from the latter. This connection allowed the trains from line M3 to use the "Obolon" depot, until the line does not get its own. It was not a full opening, however, because, until 30 April 1990, the exit from "Zoloti vorota" station was only possible via "Leninska" station. The exit from the then northern terminus onto Volodymyrska street was only opened on 1 May 1990. A total of 31 stations and 34.6 km of passenger tunnels were constructed during the first 31 years of the subway system in the Soviet Union. Even though Ukraine met severe economical problems at the dawn of independence, the momentum of subway construction was not at all lost: on 30 December 1991, "Druzhby narodiv" and "Vydubychi" stations were opened. "Pecherska" station was not opened then, but on 27 December 1997, since its construction had to be frozen due to hydrotechnical problems. In that way, the line reached Dnieper, which it crossed exactly a year later via the Southern Bridge, with the creation of "Slavutych" and "Osokorky" stations. Initially, the metro bridge (not to be mistaken with Metro Bridge to the north) was intended to be covered by an aluminium construction, which was open from the sides, but it revealed it was useless when it comes to snow and rain protection - the reason the whole construction started. That is why a third of the bridge section is not covered at all, as of 5 July 2017. While the construction of the bridge segment was in progress, "Telychka" station was as well under construction, but, as it was built in a heavily industrialised area, where factories started to close, the construction site was abandoned. What remains of it now is a platform and a ventilation shaft, so the station can be used in emergency cases (e.g. fire or train's breakdown). Two years later (on 28 December 1994), the line was further extended to the east, when two stations, "Pozniaky" and "Kharkivska" were revealed to public. The former is special in a way that it is the first distinctly three-floor underground station in Kyiv, with the lower one being used by the underground, while the middle and the top ones by small market stalls. The technique will enable Pozniaky to easily become a transfer hub, when the Livoberezhna line is built, by removing the stalls in favour of passengers transferring to/from the planned line M5. The opening was crucial for the rapidly developing Poznyaky and Kharkivskyi residential districts. In mid late 1990s construction began on expansion to the older Syrets' district in the northwest direction with the first extension made on 30 December 1996. Then, "Lukyanivska" station became the terminus of the line. "Lvivska brama" station, between "Zoloti vorota" and "Lukyanivska", was also built, although the works came to a halt in 1997 after it came out that it was not feasible, there was no money and that there was no agreement upon how the L'vivska square should be reconstructed. On 30 March 2000, the next station on the line, "Dorohozhychi" was opened, "Hertsena" station was planned, situated between "Lukyanivska" and "Dorohozhychi" and some say some initial stages of construction started, in fact, however, further building was abandoned. Neither the current official scheme (see below) nor the earlier one do not indicate the station altogether. Four years later, on 14 October 2004, the green line was further extended to the north-west, finishing at "Syrets'", which is the current terminus of the line. At the same time, works were done on the southeastern stretch of the line, with "Boryspilska" station opened on 23 August 2005, and "Vyrlytsia" on 7 March 2006. At first, what was to become "Vyrlytsia" was an emergency exit, and the station was not planned to be built, but the City Council later decided, in November 2005, to convert the exit into a full station, which is the reason why this station has side platforms. Later on, on 23 August 2007, the third and newest depot in the Kyiv underground - Kharkivske depot, was opened. The last station on the green line was as well under construction - "Chervonyi Khutir", from September 2005, but it could have been never opened to public, as, in April 2007, Leonid Chernovetskyi, then Mayor of Kyiv, fearing the station will have a low ridership, claimed the station will be subject to conservation, as "animals do not ride in the underground" (he meant that the station was situated literally in the forest, with not many buildings nearby, so there were no people to use the station). Nevertheless, the works continued, and, after a few months' delay, the station opened on 23 May 2008, to the Kyiv Day celebration. It was most probably done due to the Mayor elections upcoming on 25 May 2008. However, this station still has the lowest ridership in the Kyiv Metro. That was the last opening of line 3. Until the 2000s, the line finished at "Sviatoshyn" (renamed in 1993 from "Sviatoshyno") at the western end. However, since 1971, new apartments, mostly in Bilychi and western Sviatoshyn, emerged, which created a need for an extension of the line to the housing facilities. Construction of the 3.3 km (2.1 mi) last section of today's line M1 started in fall 2000. Two stations were built: "Zhytomyrska" and "Akademmistechko", with delays, however, due to irregular financing. For the purpose of construction, Peremohy avenue was partially closed from 14 January 2001 to 25 December 2002 (with periods of full blocking of this communication artery), because the tunnels were built beneath. Finally, the last extension of line M1 was opened on 24 May 2003. Works on the construction of the southwestern segment of line M2 started in summer 2005, 21 years after the Lybid' river accident. Difficult terrain made the workers fall behind the schedule, partly because of accidents there (such as one in January 2006 on "Demiivska" station construction). This station, as "Holosiivska" and "Vasylkivska", were opened on 15 December 2010. The 50th station, "Vystavkovyi tsentr", was unveiled a year later, on 27 December 2011. "Ipodrom" followed suit on 25 October 2012. Initially, "Ipodrom" was planned to be opened together with "Teremky" station in November 2012, but, with the lack of financing and lagging behind the schedule, only "Ipodrom" was opened by then (ahead of schedule, partly thanks to funds reallocation, and partly because of the 2012 parliamentary elections due for 28 October), while the "Ipodrom"-"Teremky" section would wait for 2013 underground construction funds. As there was no turnaround option for trains there, a shuttle train was driving between "Vystavkovyi tsentr" and "Ipodrom" stations, until "Teremky" station was opened on 6 November 2013, to commemorate the 70th anniversary of Kyiv liberation. This, as of December 2018, is the last extension or opening of any underground-connected facility (if not take into account the opening of the second exit from Osokorky station, which was built together with station, but opened only in 2014). In the 1990s, the Kyiv Metro authority was mostly concerned with new underground building, rather than old infrastructure modernisation. This changed in March 2001, when an experimental modification of 81-717/714 trains, the Slavutych 81-553.1/554.1/555.1 wagon, was launched from Obolon depot. It included an increased number of electronical devices and induction motors (instead of synchronical ones in earlier series). The train model, however, was not released into mass production, so the test train remained the only one from its series. The experimental 81-553.1 train is still operated on the Obolonsko–Teremkivska line between 7-10 a.m. on weekdays. The modification of 81-717/714 (81-717.5М/714.5М) trains arrived three years later to the "Darnytsia" depot. A new generation (81-7021) Kiev metro train being prepared for use in its depot. Another modification of the 81-717/714 series, 81-7021/7022, made by Kryukiv wagon-manufacturing plant were first unveiled to then President of Ukraine, Viktor Yushchenko, while opening the "Boryspilska" station. Five months later, a sample was sent to Darnytsia depot for trials, where an error was detected. 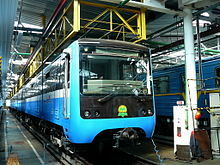 To accept the first underground train made in Ukraine in the Kyiv Metro, further tests were conducted from 17 June 2006 in the "Obolon" depot. Finally, in July 2008, the trains were accepted by the governmental commission and were given a special license allowing them to be mass-produced. (accordance with Ukrainian technical standards). They started carrying passengers in 2009. 81-7021/7022 are supposed to substitute the older 81-717/714 trains, but, as of 5 July 2017, there is only one train of such a model. The next modified trains, 81-540.2К/81-714.5М, made by "Wagonmash" (St. Peterburg) and Metrowagonmash, are another modification of 81-717/714, arrived in 2010, with additional trains set on rail in 2013. Finally, in 2014-2016, new trains, 81-7080 model, were transported from KVBZ to the Kiev underground, which are now actively used on line M1. In October 2005, new escalators were installed on "Lisova" and "Syrets" stations, as a movement for modernisation in the former case, and, in the latter, as part of a pylon station's equipment. The following year, a modernisation of "Darnytsia" station was made, with the second exit towards Popudrenka street built. In March–May 2017, a ₴24.84M ($915.9K) refurbishment of "Livoberezhna" station was made to the second Eurovision session in Kyiv. As of 6 July 2016, 3 lines are now being operated, with a total length of 67.6 km (42.00 mi). Additional 2.048 km (1.27 mi) that appear in the table is the length of technical tunnels, used by trains to switch from one line to another. The lines' names are derived from the 1945 underground construction plan (from the proposed final stations, to be exact), which is why line 1 is called "Sviatoshynsko-Brovarska", despite finishing 11 kilometers short of its centre (the official Metro site says "the extension to Brovary is possible in far future"), while the blue line's route does not pass through Kurenivka. In February 2018 the Kiev City Council renamed "Kurenivsko-Chervonoarmiyska" line into "Obolonsko-Teremkivska". Colloquially, lines are rarely referred by their full names, but rather by their numbers or colors, e.g. "Syretsko–Pecherska line" is usually referred as "The Third line" or "The Green line". A Kiev Metro station (street level) sign. All of the stations on the eastern bank of the Dnieper river are either ground or above ground level, this attributed to a similar experiment like Moscow's Filyovskaya Line. The milder Ukrainian climate, however, prevented the stations there from being severely deteriorated, which was why extensions in 1968 and 1979 were kept from going underground. The five original stations managed to survive Nikita Khrushchev's struggle with decorative "extras", although more pompous projects were proposed in Stalin's times. The five stations are recognised as architectural monuments and thus are protected by state. The red line (as signed on maps) is the busiest and carries 557.9K passengers daily (2015). The 20.95 km (13.02 mi) Obolonsko–Teremkivska line, is the second line of the Kiev Metro, first opened in 1976. Initially, it extends southwards along the right bank of the Dnipro river, but starts deviating from the river towards the southwest from "Lybidska" station on. Most of the stations were built in the 1970s and 1980s, architecturally the line shows some of the best examples of late-Soviet architectural features (with "Lybidska" station being an architectural monument protected by the state), while the newest ones, built in 2010-2013, are a good example of modern stations with some national decoration motifs ("Teremky" station) with access for disabled. The blue line carries 460.9 thousand passengers daily. The longest line in the Kyiv Metro (23.9 km (14.9 mi)), Syretsko-Pecherska Line is the third line of the Kiev Metro, first opened in 1989. It is a major northwest-southeast axis of the Kyiv rapid transit system. It starts on the right-bank side of Dnieper River before crossing it on a partially covered bridge and then going on the southeastern residential districts of Kyiv. The line is one of the newest and shows some post-independence decorative motifs. Technically, it is also a great development, with most of the platforms longer and wider than older sections and with some stations having provision for disabled access. The line features a planned station and two formally under construction (actually construction suspended), which is partly the reason for its extremely long distances between some stations ("Vydubychi"-"Slavutych" tunnel is the longest in the Kyiv Metro, as 3.046 km (1.893 mi) separate the two stations). This line is coloured green on maps. Universytet station's vestibule is recognised as an outstanding architectural monument of Kiev. The metro follows a standard Soviet triangle (three line and six radii) layout that intersects in the centre where the stations are built very deep underground and could potentially double as bomb shelters. There are now 52 stations. There are 20 deep-lying stations, of which 17 are of pylon type (including the only "London style" station in the former USSR that exists today - "Arsenalna") and 3 of column type. Of the 26 sub-surface stations, 13 stations are of pillar-trispan type, three are side-platform pillar bi-spans, 8 more are single-vaults, and further three are asymmetrical double deck bi-spans. In addition, 6 stations are located above ground, of which four are surface level, and two are flyover. Most of the stations have large vestibules, some on surface level whilst others are underground interlinked with subways. Access for disabled persons, previously overlooked, has become an important issue, and all new stations have been constructed with necessary provisions. "Arsenalna" station is as well unique since it is the deepest station in the world (105.5 m, considering the distance between the surface above the station and the station itself). The next station, proceeding towards Dnieper, "Dnipro", is overground, which makes the "Dnipro"-"Arsenalna" tunnel the one which makes across the highest elevation difference in the world, considering surface's relative height. There are three stations that are awaiting to appear: "Lvivska brama", "Telychka" and "Hertsena", all on the green line. The last of them had only initial stages of construction done, while the former two are more advanced in construction (ca. 30–70% of work done), yet they do not have conventional exits. Stations constructed after 2005 are way better adapted for handicapped people, than older ones, e.g. they have elevators and turnstiles wide enough for a wheelchair to pass. But overall, Kyiv Metro is poorly adapted for handicapped. Universytet, an earlier, more ornate station from the 1960s. Hidropark, opened in 1965, is one of a small number of above-ground stations. Nyvky, a typical 1970s 'centipede' style station. Klovska is a good example of a typical late 1980s Kiev metro station. Like all Metro systems in the former Soviet Union which are known for their vivid and colourful decorations, Kiev's is no exception. The original stations of the first stage are elaborately decorated, showing the postwar Stalinist architecture blended with traditional Ukrainian motifs. Many first projects for stations offered at the beginning of the 1950s were full of rich decorative elements such as mosaics, ornaments, bas-reliefs, sculptures and a lot of marble. Each station was to have its own original shape. These stations were to be constructed in a monumental style like those stations built throughout the 1950s in Moscow and Leningrad. For example, Arsenalna station, instead of a small central hall, should have had a wide hall with sculptures of warriors of the civil and great patriotic wars; Vokzalna station was to be decorated with ornaments and bas-reliefs on columns and a big decorative map of the Ukrainian SSR, whilst Politeckhnichniy Institut station had, on its first project drawings, large mosaic panels depicting elements relating to the natural sciences. By the end of the 1950s, a period of functionality and struggle against architectural extravagances had begun in Soviet architecture; this action, propagated by Khruschev, resulted in the loss of many unique projects, with the resulting stations being finished with few decorations, compared to 1952 projects. Universytet station was, however, the subject of much less simplification than many others, retaining its many pylons adorned with the busts of famous scientists and writers. The next stations that opened in 1963 had an ascetic and strict appearance. Open-air stations, that opened in the 1960s and later the underground stations of 1971 were built to a standard primitive project, the so-called sorokonozhka (Russian for centipede); a name which came about due to the many thin supports to be found on both sides of the platform. Functionality became the most important factor in newer designs, and stations built at that time were almost identical in appearance, save the design of tile patterns and pillar covering material. Only in the 1970s did decorative architecture start to make a recovery. The stations built from the 1980s onwards show more innovative design when compared with stations of the same era in other cities of the former USSR. Also, some of the older stations have undergone upgrades to lighting and renovation of some decorative material. After the declaration of Ukrainian independence following the dissolution of the Soviet Union in 1991, some of the Soviet symbols originally incorporated into decor were adapted to modern times or removed altogether by altering the architectural composition of those stations. All these Soviet symbols are due to be removed due to 2015 decommunization laws. Slavutych metro station of Syretsko-Pecherska Line. As of 2015, "Lisova" was the busiest station in the Kyiv Metro, passing 58.5 thousand passengers per day (on average), with Vokzalna following (55.9K). The congestion on "Vokzalna" station, especially in rush hours, is particularly problematic due to the station having only 3 escalators and only one access point for entering and exiting the station. "Akademmistechko" is third with a ridership of pf 51.1 thousand passengers per day. These are the only stations which have a handle more than 50,000 passengers/day. "Livoberezhna", on the same line, handles 48.1 thousand per day. The fifth place belongs to the station from the blue line (M2) when it comes to passenger flow - "Pochaina" (46.2 thousand), with "Minska" not far behind at 45.5 thousand. On the Syretsko-Pecherska line, the busiest station is "Lukyanivska", with just under 40 thousand passengers per day going through its turnstiles. In contrast, the least busy station in the system is the "Dnipro" station (red line), with a mere 2.8 thousand passengers using its services daily. "Chervonyi Khutir" (M3) is another station with a daily passenger flow less than 5,000. The emptiest station on the blue line is "Poshtova Ploshcha", accepting 8.9 thousand people. Out of the transport hubs, "Vokzalna" is the most important of them. It gives direct access to the Kyiv-Pasazhyrskiy railway station, the largest train station in Ukraine, but as well to the Kyiv Light Rail line to Borshchahivka and to the Kyiv Urban Rail ring. Another transport hubs of great importance include: "Demiivska" (to the Kyiv Central bus station), "Vystavkovyi Tsentr", "Lisova" (mostly to suburban buses, but to the "Pivdenna" and "Darnytsia" bus stations as well, respectively) and "Livoberezhna", "Darnytsia" and "Pochaina" as the stations which accept passengers on commute from Troieshchyna (the largest residential district in Kyiv). The stations on the lines come across all 10 Kyiv's districts, however, their spread is uneven—the most belongs to Shevchenkivskyi district which has 13 stations, Pecherskyi and Holosiivskyi raions both boast 11 stops, Darnytskyi - 7, Obolonskyi, Sviatoshynskyi and Dniprovskyi districts feature 4 each, Podilskyi district offers three stations, while Desnyanskyi raion, despite being the most populous district in Kyiv, is deprived of Metro communication—only 2 stations are available. 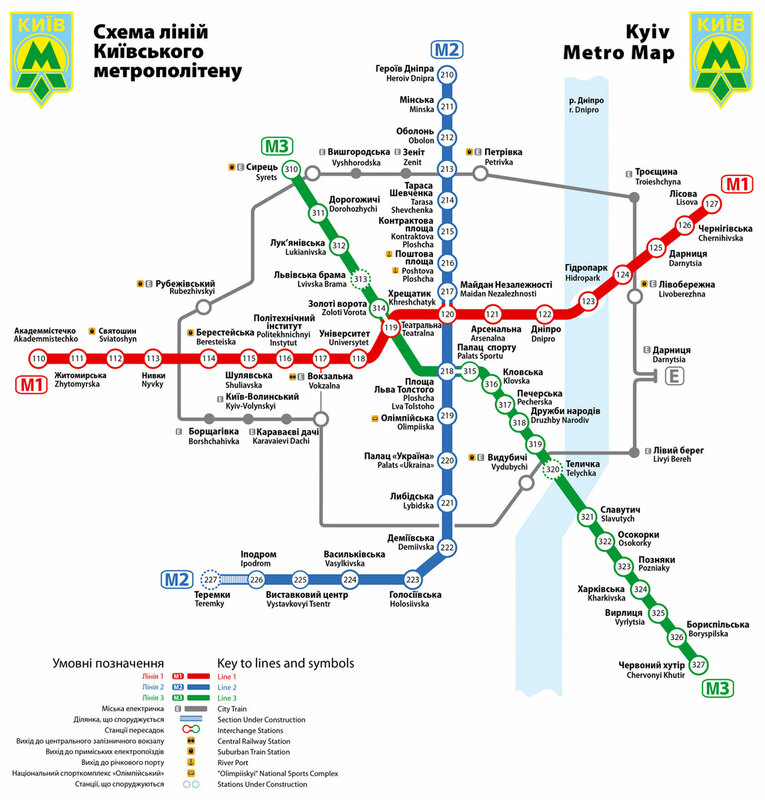 The information above reveals that the right bank part of Kyiv contains the absolute majority of the stations (including the M2 line, which does not cross Dnieper to the left bank side of the main river)—only 12 stations are offered in the eastern part of the city, compared to 40 on the opposite side. As of 2016, there were 824 wagons in operation, with another 5 spares. Most of the wagons are from the Soviet era, largely from the 81-717/714 series and some trains from the 'D' and 'E' series. The stock, however, is refreshed. The "Slavutych" trains began to replace the old trains of predominantly 81/7021-7022, 81-540.2К/81-714.5М and 81-7080 series. All of the trains contain an audio system, which announces the stations and transfer opportunities to other Metro lines. At "Arsenalna" station, there is an announcement for museums in the area. In addition, most of the older trains are fitted with an overhead video information system, which provides visual information to passengers regarding the current and the next stations and transfer opportunities between lines. While the train is in transit between stations, the system displays advertising (both in video and ticker forms), recreational video content, and local time. In December 2016, the Kyiv City Council announced that it is going to buy 709 new trains by 2025 for ₴14.96 billion (then 572.6 mln USD), 276 of which will substitute the older trains whose operation terms have expired, and another 62 for Syretsko-Pecherska line to keep the interval. The Kiev Metro is managed by the city-owned municipal company Kyivsky Metropoliten (formally formerly known as Kyivsky ordena Trudovogo krasnogo znameni Metropoliten imeni V.I. Lenina) which was transferred in the early 1990s from the Ministry of Transportation. The Metro employs several thousand workers in tunnel and track, station and rolling stock management. In addition to being state sponsored for operation, income comes from ticket sales and from advertisements (controlled by a daughter company Metroreklama) that are displayed in most stations. Metro lines are being constructed by Kyivmetrobud public company which allocates segments of construction to individual brigades that are responsible for tunnel and station construction. Kyivmetrobud is directly funded by the profits of the Metro and from the city and state budgets. Most of the state funding comes from Kiev's municipality, while additional subventions are directly received from the State budget, since the fares do not correspond to the optimal price which will give the possibility for the Kyiv underground to develop itself. The current director is Viktor Brahinsky. In 2016, the "Kyivsky Metropoliten" enterprise received ₴76.1 million of net income (ca. $2.85 million), versus 119 million UAH of loss a year earlier. A single ride costs 8.00 hryvnia ($0.29) regardless of destination and number of transits within the metro. The ride is paid by plastic tokens, paper QR tickets, or contactless cards. Plastic tokens are used for turnstiles; the tokens can be bought from cashiers at all stations (but only one token per person) or from automatic exchange machines. The current tokens are of blue color again; green tokens were used in 2000-2018 and from 2015-2017. Initially, the green (old) tokens they were to be substituted by QR-code tickets (introduced August 2017) and RFID cards, but tokens are still used as of December 2018. Contactless (RFID-based, MIFARE Classic and Ultralight) cards are also used to enter the metro. The card can be purchased for a small fee (15 hryvnias ($0.54); refundable should one want to return the card) from cashiers and loaded for up to 50 trips at once (so that not to exceed the 100-ride limit) and with a special gradual scale of prices, such that the every tenth purchased access (bought once) makes every previous one cheaper by 0.30 hryvnias, i.e. each ride, if bought up to 9 accesses, costs the same as in the case of tokens, whereas for 10-19 rides, the price for each one is 7.70 hryvnias, for 20-29 rides - 7.40 hryvnias, and so on, thus, if one loads the card with 50 rides, has to pay only 6.50 hryvnias ($0.23) per ride. The passenger can also pay for the fare using a bank card. There are accepted MasterCard PayPass  or Visa PayWave cards. Google Pay and Apple Pay can also be used to enter the metro. The cards can be recharged either by a cashier, or by using a terminal. The terminals accept hryvnia paper bills in denominations of 1 to 50 UAH, but do not return change; instead they refill the card for the maximum possible number of rides given the sum of money deposited into the machine, and store the remainder in the system, to be used at next refill. Also, another type of cards can be purchased for unlimited rides within one or half a month (380 hryvnias ($13.46) per month), or for a limited number of them (62 or 46 rides per month, or half of it for 15 days, with the fare of 3.87 and 4.13 hryvnias per ride, respectively). A seven-minute second-use lockout is imposed for all unlimited cards to prevent abuse. Quartlerly and yearly tickets used to be valid until December 2009, when they stopped being released because they generated then estimated 115.6 million hryvnia (then approx. $14.5 million) of losses annually. In the late 1990s – early 2000s (over a decade), monthly unlimited metro passes with a magnetic strip were used, before being phased out in favor of RFID cards, due to reliability and counterfeiting issues. Originally the Metro ride cost was 0.5 Soviet rubles (50 kopecks), however, in 1961, following the Soviet revaluation of the Ruble, and for the next 30 years, the ride was fixed at 0.05 rubles (5 kopecks). Since 1991, as Ukraine suffered from hyperinflation, the price gradually rose to 20,000 karbovanets, by 1996. Following the 1996 denomination 20,000 karbovanets became 0.2 hryvnias (20 kopiyok), although karbovanets sum was still payable up to 16 September that year. Since then, the price has risen to half a hryvnia in 2000 and to 2 hryvnia in 2008. In November 2008, when the price was increased to 2 hryvnia, public protests took place and the Antitrust Committee of Ukraine ordered to decrease the price to 1.70 hryvnia. In September 2010 the price was increased back to 2 hryvnia. In February 2015, the price was further increased. The last increase occurred on 15 July 2017. The fares are set by the Kiev City Administration subject to approval of Ministry of infrastructure. A proposal to set prices according to the distance traveled, or time spent in the metro, is being discussed. For this purpose, specially built "long" exit turnstiles with card readers at the far end have already been installed at some station exits. In 2012, plans for the Kiev Metro aimed to nearly double its length by 2025. Whilst completion of this plan is not considered to be feasible, a number of new stations have opened since the turn of the millennium. Map of the planned expansion of the Kiev Metro (on the basis of the 2005 general plan). The fourth line of the Kiev Metro (also known as "Podilsko-Voskresenska" line) will connect the northern Troieschyna districts of the left bank with the future business center of Rybalskiy Island on the Dnieper River, from there it will continue into the Podil region. The line will continue westwards along the northern slope of the Starokyivska Hora and into the northwestern part of central Kiev, where it will turn south and reach the Kiev Passenger Railway Station. In doing so it will offer transfers to all three other Metro lines and thus relieve the over-congested transfer points in the center. The last planned stage will connect the line to Kiev's Zhuliany airport and the residential districts on the way there. The line first appeared in plans in 1980, when a new plan of Kyiv Metro development appeared. The section between Voskresenka, 2 km south of Troieshchyna, and Vokzalna (through "Chervona ploshcha" (now "Kontraktova ploshcha" station, instead of today's plan to direct it via "Tarasa Shevchenka"), was planned to be open by 2000. The plans changed, however, as people started protesting about the passage of the line via the historical part of Podil, which resulted in the line being rerouted. The feasibility of the line was subject to discussion, and alternative projects have been proposed, to construct the light rail or light metro instead. As of 6 July 2017, however, the subway option is still preferred, despite the route being altered from plan to plan. In May 2017, the Kyiv City Council signed a memorandum with a Chinese consortium (which includes the China Railway International Group and the China Pacific Construction Group) to assess the current advancement of the project and, eventually, to finally construct the line. Preparatory works for construction renewal are said to take place. The first segments of the line (colloquially called "metro to Troieshchyna") are planned to be finished by 2025, while further construction will most probably end after 2030. The line first appeared on maps as a planned line in 1974. The northern end of the fifth line of the system exists already as part of the Kiev tram, however it will require conversion and, according to some projects, will be temporarily operated by the Podilsko-Vyhurivska Line as a branch. Eventually a southwards extension will commence that will follow along the left bank of the Dnieper to Southern Osokorky district, this will be the last project in the Metro that is envisioned in the present expansion plan and is not expected to be completed until the end of the 2030s. In 2009, it was planned that the first stage of this line will be launched in 2019. As of 6 July 2017, however, no tender for construction has taken place and construction has not begun. Vyshhorodsko-Darnytska line is a proposed line in the Kyiv underground. Currently, it is under planning, and the line was expected to be built in distant future (as of 2012, any construction was predicted to start only after 2025), however, shortly after the announcement of such proposal, the project has been resigned from. Apart from the earlier mention that the subway to the town of Brovary is to be constructed in far future, the much closer (in terms of construction) extension is the one to "Novobilychi" station, with the depot. In 2011, Volodymyr Fedorenko, then head of the "Kyiv Metro" communal enterprise, said it was possible that the extension be constructed by 2020. The construction in the near future, however, is unlikely, as the line 4 construction is currently the absolute priority; moreover, the station's location will not bring the line to any significant residential area (Bilychi, the nearest one, are exactly west of "Akademmistechko"). As of 30 January 2018, no tenders have taken place. A planned extension of line 2 will feature a side branch: the side branch will go to the "Teremky" bus station, opened in December 2016, and will serve the Teremky-2 and Teremky-3 residential areas, while the main line is expected to go further southwest to "Odeska" station. For the moment being, the extension is not a priority. The extensions for line 3 proposals were different over time. In the 2005 general plan, the line was supposed to turn sharply from Chevony Khutir to Darnytsia railway station, with subsequent extension to Livoberezhna. Presumably, the offer was declined, as later plans do not include any line's prolongation beyond Chervony Khutir. In April 2017, Kiev's Mayor Vitaliy Klychko and Ukraine's Minister of infrastructure, Volodymyr Omelyan, announced they: "were talking about the project of subway extension from "Boryspilska" metro station to "Boryspil" airport with the help of private financing", although the project's ca. 15 km (9.3 mi) extension is unlikely to happen in the near future. The northward extension to Vynohradar was a long-planned event, with first maps appearing in "Vechirniy Kyiv" newspaper in August 1970, however, it was not a priority. In February 2017, however, an article suggested that the plans were already given for analysis, and that construction had to start by late 2017. The project, the article mentions, will feature an engineering feet not made before in Kyiv: instead of parallel tunnels, one tunnel will be on top of another. On 6 July 2017, the Chinese Machinery Engineering Corporation said it was ready to invest and to build the line to Vynohradar. In February 2017 the line's extension (two stations: "Mostytska" and "Prospekt Pravdy" (earlier known as "Vynohradar") was scheduled for late-2019 opening. In November 2018 Kiev Metro signed a contract for the build of the Mostytska and Prospekt Pravdy subway stations and a branch line toward the Vynohradar station, the deadline for completion was set for 2021. Further plans feature another extension to "Marshala Hrechka" (earlier known as "Synioozerna") with "Vynohradar" depot built as well. Ukrainian language signs are dominant throughout the Kiev metro. The use of Russian and Ukrainian languages in the Kiev metro can be taken as a good illustration of the linguistic policies of the Soviet Union and Ukraine. When the Metro was opened in 1960, although many workers and all technical level documents were using Russian, nevertheless all the signs and announcements used Ukrainian exclusively. One local story suggests that Yivga Kuznetsova, then a student of Kyiv university, forced the local city council to make all the announcements in Ukrainian only. 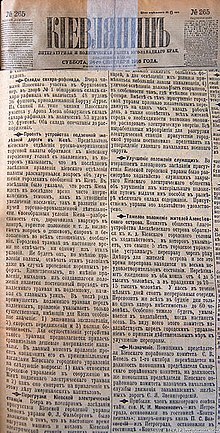 The lexical similarity of the languages allowed every station to have a Russian translation and these were often given in Russian language literature and media. However some Ukrainian names for stations were different from Russian ones, and to signify this, those stations were sometimes semi-translated into Russian, effectively blending Ukrainian words into Russian grammar. Examples of this include ploshcha Zhovtnevoi Revolutsii, Zhovtneva and Chervonoarmiyska (later renamed to Maidan Nezalezhnosti, Beresteiska and Palats Ukrayina respectively) which when translated into Russian would become Oktyabrskaya and Krasnoarmeiskaya. The names were instead given as Zhovtnevaya and Chervonoarmeiskaya. (If the semi-translation continued today, Chervony Khutir, which, when translated into Russian would become Krasnyi Khutor, would be instead given as Chervonyi Khutor). During the 1980s, partly due to Shcherbytsky's gradual Russification campaign, and partly due to Kiev becoming increasingly Russophone, the metro started to change as well. Although the stations retained their original Ukrainian titles on the vestibules, Russian appeared together with Ukrainian on the walls, and replaced Ukrainian in signs and voice announcements. Stations that were opened during this period still had Ukrainian names appearing along with Russian ones on the walls, but now all the decorations, where slogans were included, became bilingual as well. Also during this time, the unique practice of blending Ukrainian into Russian was dropped, and those selected stations were named in standard Russian translation. During Perestroika in the late 1980s, bilingualism was gradually introduced in signs and in voice announcements in the trains. Prior to 1991, this was done with Ukrainian following Russian, but after the republic's proclamation of independence in August 1991 the order was changed to Ukrainian preceding Russian. After the fall of the Soviet Union in late 1991, both signs and voice announcements were changed from bilingualism to just Ukrainian due to the Ukrainianization policy. However, the Russian names are still used in Russian-language literature and some documentation, and some of the decorations still feature bilingual inscriptions. The usage of English in announcements and on stations started before Euro-2012, and all stations now feature Latin transliteration on both signs and official maps. Kiev's underground was subject to renaming. Different stations operated under different names (see), especially during planning phases. Not so many changes were done to the already completed stations, however. The only change from Communist name to another Communist name of the Kiev metro's station name happened in 1977, when "Ploshcha Kalinina" was renamed to "Ploshcha Zhovtnevoi Revolutsii", as the 60th anniversary of the October Revolution celebrations were upcoming. During the 1990s, however, the changes were already significant, and were mostly concerned with Communism-related people. On 15 October 1990, "Chervona Ploshcha" was renamed to "Kontraktova Ploshcha", while "Prospekt Korniychuka" station's name was changed to "Obolon". Moreover, another then uncompleted station's name was changed from "Artema" to "Lukyanivska". Another name change happened two days after the declaration of independence: on 26 August 1991, "Ploshcha Zhovtnevoi Revolutsii" became known as "Maidan Nezalezhnosti". Chervonoarmiiska (Red Army) Palats "Ukraina"
In 2011, when "Respublikansky stadion" station was renamed to "Olimpiiska" station, which happened in preparation for the Euro-2012 football tournament. In 2018 Petrivka (after Grigory Petrovsky) station was renamed Pochaina to honor the almost disappeared river that once went near the station's location. The station had to be renamed to comply with 2015 decommunization laws. Vsevolod Nestayko's "Toreadory z Vasyukivky" (Torreadors from Vasyukivka) mentions Kyiv underground as a major tourist attraction of the 1960s. ^ a b c d Про метрополітен [About the subway] (in Ukrainian). Київський метрополітен [Kiev Metro]. Retrieved 2015-08-01. ^ a b c d e f g h i j Основные технико-эксплуатационные характеристики метрополитенов за 2016 год [Main technical and operational specifications for Subways for 2016.] (pdf). asmetro.ru (in Russian). Международная Ассоциация "Метро" [International Association of Metros]. 2016. Retrieved 2017-07-06. ^ a b c "Metrostat-2015.png – Просмотр картинки – Хостинг картинок, изображений и фотоальбомов". hostingkartinok.com. Retrieved 2017-07-06. ^ Основные технико-эксплуатационные характеристики метрополитенов за 2014 год [The main technical and operational features of undergrounds. 2014] (PDF). asmetro.ru (in Russian). 2014. Retrieved 2017-07-06. ^ Арсенальна [Arsenalna] (in Ukrainian). Київський метрополітен [Kiev Metro]. 24 October 2008. Retrieved 2015-04-04. ^ a b c Dzygoon, Vadim. Історія [The history]. www.metropoliten.kiev.ua (in Ukrainian). Retrieved 2017-07-04. ^ Проектъ устройства подземной желѣзной дороги въ Кіевѣ (in Russian). Retrieved 2017-07-04. ^ Ковалинський, Віталій (2002). Київські мініатюри [The Kievan miniatures] (in Ukrainian). 1. Kyiv: Літопис. ^ a b c d "Історія метро - від першої ідеї до першої черги | Київський метрополітен" [The history of the underground: from first plans to first section. The Kiev Metro]. www.metro.kiev.ua (in Ukrainian). Retrieved 2017-07-04. ^ a b Волков, В. (7 July 1945). Дякуємо тов. Сталіну за Сирецько-Печерську лінію! [Dear comrade Stalin, thank you for the Syrets'ko-Pecherska line!]. «Радянська Україна» (in Ukrainian). Retrieved 2017-07-05. ^ a b c d Тоцкий, Олег (8 Feb 2012). Метро, которого нет: конкурсные проекты 1952 г. [The underground that does not exist: the competition projects from 1952] (in Russian). Retrieved 2017-07-04. ^ a b Тоцкий, Олег (2012-02-02). Метро, которого нет: станция "Днепр" [The underground that does not exist: "Dnipro" station] (in Russian). Retrieved 2017-07-05. ^ Nemiroff. "Таємниці найглибшої у світі станції метро — "Арсенальна"". ukrainemiroff.com. Retrieved 2017-07-04. ^ "6 листопада 1960 року розпочав роботу київський метрополітен". photo.ukrinform.ua. Retrieved 2017-07-04. ^ a b kievpress (2010-11-05). Київському метрополітену - 50! Як все починалося [Kiev Metro is 50 years old! How everything started]. kievpress (in Ukrainian). Retrieved 2017-07-04. ^ Марченко, Марина (6 Nov 2012). Перший машиніст підземного міста [The first motorman of the underground city]. "Вечірній Київ" (in Ukrainian). Archived from the original on 2016-04-04. Retrieved 2017-07-04. ^ ПРОБНЫЙ ПОЕЗД [The trial ride]. www.metropoliten.kiev.ua (in Russian). Retrieved 2017-07-04. ^ a b c d e f g h История киевского метрополитена [The history of Kiev underground] (in Russian). 23 Sep 2011. Retrieved 5 July 2017. ^ a b Nuclear Attack: история киевского метрополитена [Nuclear Attack: the history of Kiev subway]. www.nuclear-attack.com (in Russian). Retrieved 2017-07-04. ^ Stefanovych, F. (5 Sep 1965). Свято метробудівців. [Вчора о 12:00 відкрито другий вихід зі станції метро «Хрещатик»] [The feast for underground constructors. [The second exit from "Khreshchatyk" station was opened yesterday at noon].]. Київська правда (in Ukrainian). ^ Moiseev, M. (4 Sep 1965). "Восьмі ворота метро (The eighth gate of the underground)". Вечірній Київ. ^ Bilous, V. (1 June 1970). Мчать голубі експреси. [Декілька днів тому здано в експлуатацію третій вихід зі станції метро «Хрещатик»] [Blue express trains run. [A few days ago the third exit from Khreshchatyk station was given to use]]. Вечірній Київ (in Ukrainian). ^ Масленков, И.; Дышло, И. (1971). Новая линия киевского метро [The new line of the Kiev underground]. Строительство и архитектура (in Russian) (2). pp. 19–24. Retrieved 5 July 2017. ^ Схема розвитку метро [The underground development scheme]. Вечірній Київ (in Ukrainian). 9 Mar 1963. ^ Історична Довідка - Оболонська районна в м.Києві Державна Адміністрація [The historical note. Obolon' District Government Administration in Kiev]. obolon.kievcity.gov.ua (in Ukrainian). Retrieved 2017-07-05. ^ Как придумали Оболонь? [How Obolon' was created]. Интересная Оболонь (in Russian). 2015-11-07. Retrieved 2017-07-05. ^ Gazeta.ua (2007-09-07). У давньому Києві були дерев"яні тротуари [Ancient Kiev had wooden sidewalks]. Gazeta.ua (in Ukrainian). Retrieved 2017-07-04. ^ a b c d e "Хронологія розвитку метро | Київський метрополітен" [The chronology of underground development. The Kiev underground]. www.metro.kiev.ua (in Ukrainian). Retrieved 2017-07-04. ^ Рейковий пасажирський транспорт [The rail passenger transport]. КП "Київгенплан" (in Ukrainian). 2014-11-17. Retrieved 2017-07-04. ^ "Площа Льва Толстого | Київський метрополітен" ["Ploshcha Lva Tolstoho" | The Kyiv underground]. www.metro.kiev.ua (in Ukrainian). 24 Oct 2008. Retrieved 2017-07-05. ^ "Олімпійська | Київський метрополітен" ["Olimpiiska" station | The Kyiv underground]. www.metro.kiev.ua (in Ukrainian). 24 Oct 2008. Retrieved 2017-07-05. ^ Метро діє, розширюється: [Вчора відкрито другий пересадочний вузол між станціями метро «Хрещатик» і «Площа Жовтневої революції»] [The underground works and expands: [The second transfer corridor between "Khreshchatyk" and "Ploshcha Zhovtnevoi Revolutsii" stations was opened yesterday.]]. Вечірній Київ (in Ukrainian). 4 Dec 1986. ^ Мотлях, П. (31 Dec 1987). І стала зупинка станцією. [Учора відкрито новий вихід на станції «Гідропарк»] [And a stop became a station [Yesterday, a new exit from Hidropark station was opened]]. Вечірній Київ (in Ukrainian). ^ a b Kozlov, P.; Mashkevych, S. (2009). Київський тролейбус [The Kievan trolleybus] (in Ukrainian). Kyiv: "Кий". ISBN 978-966-8825-58-3. ^ "Печерська | Київський метрополітен" ["Pechers'ka" station | The Kyiv underground]. www.metro.kiev.ua (in Ukrainian). 24 Oct 2008. Retrieved 2017-07-05. ^ В киевском метро обнаружили секретную станцию "Теличка" ["Telychka" secret station was found in the Kiev metro]. Mignews.com.ua (in Russian). 28 Nov 2011. Retrieved 2017-07-05. ^ "Позняки | Київський метрополітен" ["Pozniaky" station | The Kyiv underground]. www.metro.kiev.ua (in Ukrainian). 25 Oct 2008. Retrieved 2017-07-05. ^ "Львівська брама | Київський метрополітен" ["Lvivska brama" station | The Kyiv underground]. www.metro.kiev.ua (in Ukrainian). 7 December 2008. Retrieved 2017-07-05. ^ "Проект станции "Герцена" | Онлайн-музей Киевского метро | Все о метрополитене Киева" ["Hertsena" station project | The Kyiv Metro online museum | Everything about the Kyiv underground]. subwaymuseum.net (in Russian). Archived from the original on 2017-05-09. Retrieved 2017-07-05. ^ a b Герцена/Загоровская ["Hertsena"/"Zahovorivs'ka" station]. forum.metropoliten.kiev.ua (in Russian). 9 Feb 2005. Retrieved 2017-07-05. ^ a b "Метрополитен – 50 лет в Киеве | CULT KIEV" [Underground - 50 years in Kiev]. cultkiev.com (in Russian). Retrieved 2017-07-06. ^ Бориспільська (станція метро) — WWW Енциклопедія Києва ["Boryspilska" metro station - WWW Kyiv encyclopaedia]. wek.kiev.ua (in Ukrainian). Retrieved 2017-07-05. ^ a b Korrespondent.net (12 Apr 2007). Столичну станцію метро Червоний хутір законсервують [The capital's "Chervonyi Khutir" metro station will undergo conservation] (in Ukrainian). Retrieved 2017-07-05. ^ У Києві відкрили станцію метро "Червоний хутір" ["Chervony Khutor" metro station opened in Kyiv]. comments.ua (in Ukrainian). 23 May 2008. Retrieved 2017-07-05. ^ У 2017 році в київському метро проїхали майже 500 мільйонів пасажирів [In the year 2017 almost 500 million passengers used Kyiv Metro]. hmarochos.kiev.ua (in Ukrainian). Hmarochos. January 9, 2018. Retrieved December 10, 2018. ^ Розпорядження №827 від 25.04.2001, Про зміни в організації руху транспорту по проспекту Перемоги на період винесення інженерних мереж [Order nr. 821, from 25.04.2001, "On changes in road organisation on Peremohy avenue during the transportation of engineering devices"]. search.ligazakon.ua (in Ukrainian). 25 Apr 2001. Retrieved 2017-07-05. ^ "Святошинсько-Броварська лінія | Київський метрополітен" [Sviatoshynsko-Brovarska line | The Kyiv underground]. www.metro.kiev.ua (in Ukrainian). Retrieved 2017-07-05. ^ Авария на "Демиевской" [Accident on "Demiivska"]. Яндекс.Фотки (in Russian). 28 Jan 2006. Retrieved 2017-07-05. ^ Відкриття станції метро "Виставковий центр" [The opening of "Vystavkovyi tsentr" metro station]. ukranews_com (in Ukrainian). 28 Dec 2011. Retrieved 2017-07-05. ^ Станція "Виставковий центр" запрацює 27 грудня ["Vystavkovy tsentr" station will start function on 27 December]. Українська правда - Київ (in Ukrainian). 27 Sep 2011. Retrieved 2017-07-05. ^ "Станція "Іподром" прийняла перший поїзд (ФОТОРЕПОРТАЖ) | Київський метрополітен" ["Ipodrom" station accepted its first train (PHOTOS) | The Kyiv underground]. www.metro.kiev.ua (in Ukrainian). 22 Oct 2012. Retrieved 2017-07-05. ^ У Києві відкрито нову станцію метро “Теремки” [New "Teremky" metro station opened in Kyiv]. УНІАН (in Ukrainian). 6 Nov 2013. Retrieved 2017-07-05. ^ Мир метро / Metroworld - Подвижной состав [The Metro world / Metroworld - rolling stock]. metroworld.ruz.net (in Russian). Retrieved 2017-07-05. ^ a b Опытные электровагоны типов 81-7021/7022 [Experienced trains of 81-7021/7022 model]. vagon.metro.ru (in Russian). Retrieved 2017-07-05. ^ "Вагони виробництва КВБЗ | Київський метрополітен". www.metro.kiev.ua. Retrieved 2017-07-05. ^ "Вагони типу 81-540.2К/81-714.5М | Київський метрополітен". www.metro.kyiv.ua. Retrieved 2017-07-07. ^ "Лісова | Київський метрополітен" ["Lisova" station | The Kyiv underground]. www.metro.kiev.ua (in Ukrainian). 25 Oct 2008. Retrieved 2017-07-05. ^ Станцію метро "Лівобережна" відкрили після реконструкції. ФОТО ["Livoberezhna" station opened after renovation. PHOTO]. Українська правда - Київ (in Ukrainian). 5 May 2017. Retrieved 2017-07-05. ^ "Святошинсько-Броварська лінія | Київський метрополітен". www.metro.kiev.ua. Retrieved 2017-07-06. ^ "Kyiv's Petrivka subway station renamed Pochaina". UNIAN. February 12, 2018. Retrieved December 10, 2018. ^ a b "Розклад руху поїздів | Київський метрополітен" [The train timetable | The Kyiv Metro]. www.metro.kyiv.ua (in Ukrainian). Retrieved 2017-07-06. ^ Будівництво метро на Троєщину: з'явилися несподівані подробиці [The metro construction to Troieshchyna: unexpected details revealed]. nnovosti.info (in Ukrainian). Retrieved 2017-07-06. ^ У КМДА розповіли, якою буде нова гілка метро на Троєщину (in Ukrainian). ^ "Сирецько-Печерська лінія | Київський метрополітен" [Syretsko-Pecherska line | The Kyiv Metro]. www.metro.kyiv.ua (in Ukrainian). Retrieved 2017-07-07. ^ Самые глубокие станции метро в мире [The deepest underground stations in the world]. РИА Новости (in Russian). 28 December 2011. Retrieved 2017-07-06. ^ "Схема метро - История метрополитенов в схемах - Киев". www.metroschemes.narod.ru. Retrieved 2017-07-06. ^ Столичне метро, як і раніше, мало пристосоване для інвалідів [The Metro of the capital city is still poorly adapted for handicapped]. kyiv.depo.ua (in Ukrainian). depo.ua. September 7, 2017. Retrieved December 10, 2018. ^ a b "Вокзальна | Київський метрополітен" ["Vokzalna" station | The Kyiv underground]. www.metro.kiev.ua (in Ukrainian). 24 Oct 2008. Retrieved 2017-07-06. ^ a b c d Пассажиропоток/пассажирооборот/провозная способность [Passenger flow/passenger capacity]. forum.metropoliten.kiev.ua (in Russian). Retrieved 2017-07-06. ^ Станции метро г.Киева по районам [Kyiv's Metro stations by districts]. www.denua.com (in Russian). Retrieved 2017-07-06. ^ "Рухомий склад та спецтехніка | Київський метрополітен" [Rolling stock and special service]. www.metro.kiev.ua (in Ukrainian). Retrieved 2017-07-07. ^ a b c Київ планує до 2025 р. побудувати метро на Троєщину [Kyiv plans a Troieshchyna metro construction until 2025.]. Інтерфакс-Україна (in Ukrainian). 6 Dec 2016. Retrieved 2017-07-06. ^ "МЕТРОПОЛИТЕН ИМЕНИ В. И. ЛЕНИНА — Киев. Справочник — Гео-Киев". geo.ladimir.kiev.ua. Retrieved 2017-07-07. ^ "Kievmetrobud official web site" (in Ukrainian). Archived from the original on June 10, 2012. ^ Kyivmetrobud partner's site with correct naming of Ukrainian company Archived 2011-09-07 at the Wayback Machine Kyivmetrobud partner's site. ^ Як зросте вартість проїзду в Києві: Метро, тролейбус, електричка [How the prices will increase: Subway, bus, Kyiv urban rail]. espreso.tv (in Ukrainian). 19 June 2017. Retrieved 2017-07-07. ^ Київський метрополітен в 2016 році отримав понад 76 мільйонів прибутку [The Kyiv Metro received more than 76 million hryvnia of net income]. Уніан (in Ukrainian). 23 Jan 2017. Retrieved 2017-07-07. ^ Київський метрополітен [Київський метрополітен [Kiev Metro]] (in Ukrainian). Kiev Metro. Retrieved 2017-07-03. ^ Нові жетони у метро та QR-коди у трамваях: Київ пережив перший день подорожчання проїзду. ТСН.ua (in Ukrainian). Retrieved 2017-07-18. ^ На одній зі станцій київського метро “запустили” QR-квиток (in Ukrainian). Retrieved 2018-01-30. ^ Жетони в київському метро замінять квитки з QR-кодом [Kyiv Metro's tokens will be substituted by QR-code tickets] (in Ukrainian). 31 May 2017. Retrieved 2017-07-07. ^ "Квитки з QR-кодом у метро з'являться 2 серпня". Українська правда - Київ. Retrieved 2018-01-30. ^ "В метро Киева рассказали, сколько еще будут действовать жетоны". 2017-09-11. Retrieved 2018-01-30. ^ Что записано внутри бесконтактных карт Киевского метрополитена? (in Russian). ^ Засоби оплати проїзду [Ways to pay for a trip]. www.metro.kyiv.ua (in Ukrainian). Kyiv Metro official website. Retrieved December 10, 2018. ^ Безконтактною карткою MasterCard PayPass у метро за проїзд можна сплатити на всіх станціях [MasterCard PayPass contacless cards are accepted on all stations for payments for rides]. metro.kiev.com.ua (in Ukrainian). Retrieved 2017-07-07. ^ Розпорядження №569 Київської міської державної адміністрації від 12 листопада 2009 року "Про внесення змін до Тарифів на перевезення пасажирів у міському пасажирському транспорті - метрополітені, автобусі, трамваї, тролейбусі, фунікулері, який працює у звичайному режимі руху" [Order nr. 569 from Kyiv City Government Administration "On the introduction of changes to fares for passengers' transportation in the city's public transport - underground, buses, trolleybuses, trams and funicular, functioning on the normal basis" from 12 November 2009]. search.ligazakon.ua (in Ukrainian). Retrieved 2017-07-07. ^ Rbc.ua (10 Dec 2009). В Киеве отменены годовые и квартальные проездные билеты, - распоряжение КГГА. [Kiev cancels annual and quarterly tickets - order of Kyiv Coty Government Administration]. РБК-Украина (in Russian). Retrieved 2017-07-07. ^ "АМКУ прекратил дело о повышения тарифов на проезд в Киеве". pravo.ua. Retrieved 2017-07-07. ^ Наказ № 191 від Міністерства транспорту і зв'язку України "Про затвердження Порядку формування тарифів на послуги міського електричного транспорту (метрополітену)" від 05.03.2007 [Order nr. 191 from the Ministry of transport and communication "On the acceptation of the algorythm of fare calculations for the city's electric transport services (underground)" from 5 March 2007]. zakon3.rada.gov.ua (in Ukrainian). Retrieved 2017-07-07. ^ Турникеты и оплата проезда [Turnstiles and ride payment]. www.avangard1c.ru (in Russian). Retrieved 2017-07-07. ^ В метро Киева не будет жетонов [Kiev will not have tokens]. Inpress.ua (in Russian). Retrieved 2017-07-07. ^ a b "Офіційний курс гривні щодо іноземних валют". bank.gov.ua. Retrieved 2017-07-05. ^ Потанова № 71 Ради Міністрів Української РСР "Про нові роздрібні ціни на товари народного споживання і тарифи на послуги, що надаються населенню" від 28.03.1991 [Order nr. 71 from the Council of Ministers of the Ukrainian SSR "On the new detail prices on the items of first need and fares on services that are offered to the citizens" from 28 March 1991]. zakon2.rada.gov.ua (in Ukrainian). Retrieved 2017-07-07. ^ Постанова № 376 Кабінету Міністрів України "Про систему цін у народному господарстві і на споживчому ринку України" від 27.12.1991 [Order nr. 376 from the Cabinet of Ministers of Ukraine "On the system of prices in the state's economy and on the consumption market of Ukraine" from 27 December 1991]. zakon2.rada.gov.ua (in Ukrainian). Retrieved 2017-07-07. ^ Постанова № 193 Кабінету Міністрів України "Про внесення змін до системи регульованих цін і тарифів" від 15.04.1992 [Order nr. 193 from the Cabinet of Ministers of Ukraine "On changes to the system of regulated prices and fares"]. zakon2.rada.gov.ua (in Ukrainian). Retrieved 2017-07-07. ^ Постанова № 715 Кабінету Міністрів України "Про регулювання цін" від 23.12.1992 [Order nr. 715 from the Cabinet of Ministers of Ukraine "On the regulation of prices" from 23 December 1992]. zakon2.rada.gov.ua (in Ukrainian). Retrieved 2017-07-07. ^ Постанова № 403 Кабінету Міністрів України "Про внесення змін до регулювання цін і тарифів" від 03.06.1993 [Order nr. 403 from the Cabinet of Ministers of Ukraine "On the price regulations' and fares' changes" from 3 June 1993]. zakon2.rada.gov.ua (in Ukrainian). Retrieved 2017-07-07. ^ Постанова №676 Кабінету Міністрів України "Про внесення змін до регулювання цін і тарифів" від 30.08.1993 [Order nr. 767 of the Cabinet of Ministers of Ukraine "On the introduction of changes to prices' and fares' regulation" from 30 August 1993]. zakon2.rada.gov.ua (in Ukrainian). Retrieved 2017-07-07. ^ Постанова № 978 Кабінету Міністрів України "Про впорядкування цін і тарифів" від 03.12.1993 [Order nr. 978 of the Cabinet of Ministers of Ukraine "On the correction of prices and fares" from 3 December 1993]. zakon2.rada.gov.ua (in Ukrainian). Retrieved 2017-07-07. ^ "Tomorrow in Kiev, fares for passenger transport will double". Obozrevatel (in Russian). 6 February 2015. Retrieved 2015-02-09. ^ "New acts: how will the July changes impact the Ukrainians' wallets". Ukrainski novyny (in Russian). 3 July 2017. Retrieved 2017-07-03. ^ Розпорядження №732 Київської міської державної адміністрації "Про встановлення тарифів на перевезення пасажирів і вартості проїзних квитків у міському пасажирському транспорті, який працює у звичайному режимі руху" від 16 червня 2017 року [Order nr. 732 of Kyiv City Government Administration "On setting the fares of passengers' transportation and the costs of ride tickets in the city's public transport, circulating on the normal basis" from 16 June 2017] (PDF). Хрещатик (in Ukrainian). Kyiv City Government Administration (69 (4982)): 21–22. ^ "В Киеве построят две новые линии метро. Схема". Mignews.com.ua. Retrieved 2017-07-06. ^ a b c d e f g h i j k Тоцкий, Олег (2015-02-18). Схемы Киевского метро [Scemes of the Kiev Metro] (in Ukrainian). Retrieved 2017-07-06. ^ Рождение Подольско-Воскресенской [The birth of Voskresensko-Podolska [line]]. www.metropoliten.kiev.ua (in Russian). 25 Mar 1992. Retrieved 2017-07-06. ^ Русанівські Сади - Влада приховує, на що використає 8 млн. «мостових» гривень [Rusanivski Sady - The government hides the purpose of UAH 8M spending of "bridge" money]. sady.in.ua (in Ukrainian). 2012. Retrieved 2017-07-06. ^ "Подільський міст над Дніпром: ще 3 роки - і можна їхати" [Podil bridge over Dnipro: three more years - and we can drive]. 2017. ^ Браткова, Анастасия (2013-06-14). В Киеве начнется транспортная революция [A transport revolution will start in Kiev]. vesti-ukr.com (in Russian). Retrieved 2017-07-06. ^ У КМДА вирішили відмовитися від метро на Троєщину на користь швидкісного коридору [The Kyiv City Government Administration decided to resign from subway project to Troieshchyna in favour of the light rail]. ua.112.ua (in Ukrainian). 2016. Retrieved 2017-07-06. ^ "Троєщина: метро або трамвай" [Troieshchyna: subway or tram]. Дмитрий Беспалов | Блог (in Ukrainian and Russian). 2014-10-15. Retrieved 2017-07-06. ^ Власти Киева подписали меморандум с китайскими компаниями о строительстве четвертой линии метро [Kiev's authorities signed a memorandum with a Chinese consortium on the construction of the fourth line of the Kyiv underground.]. ZN.ua (in Ukrainian). 19 May 2017. Retrieved 2017-07-08. ^ "Two companies rival to construct the first stage of Livoberezhna line of Kyiv's metro". Kyiv Post. 31 December 2009. ^ Києву обіцяють чотири тунелі і нову гілку метро [Four new tunnels and a new subway line are promised in Kyiv]. Українська правда (in Ukrainian). 10 Jun 2013. Retrieved 2017-07-06. ^ Коник, Алиса (22 Feb 2013). Генплан Киева: как будут развиваться дороги и транспорт [The General plan of Kyiv: how roads and transport will be developing]. kiev.vgorode.ru (in Ukrainian). Retrieved 2017-07-06. ^ a b "Перспективы развития Киевского метрополитена | Мир метро". www.mirmetro.net (in Russian). Retrieved 2017-07-07. ^ a b c "Перспективи розвитку | Київський метрополітен". www.metro.kiev.ua. Retrieved 2017-07-07. ^ До 2020 року «червона гілка» метро поповниться станцією «Новобіличі» [The red line will be enhanced with the new "Novobilychi" station]. comments.ua (in Ukrainian). 2 Aug 2011. Retrieved 2017-07-07. ^ "Куренёвско-Красноармейская линия | Мир метро" [Kurenivsko-Krasnoarmiiska Line | The world of Metro]. www.mirmetro.net (in Russian). Retrieved 2017-07-07. ^ До аеропорту Бориспіль під Києвом хочуть провести лінію метро - Омелян [Omelyan: "A subway line is proposed to be built to "Boryspil" airport near Kyiv"]. gordonua.com (in Ukrainian). 27 Apr 2017. Retrieved 2017-07-07. ^ Цензор.НЕТ. "Це логічно і своєчасно": Омелян про можливе будівництво метро до Борисполя ["It is logical and up-to-date" - Omelyan on the possible metro construction to Boryspil]. Цензор.НЕТ (in Ukrainian). Archived from the original on 2017-05-01. Retrieved 2017-07-07. ^ "Issue №198 (7977)". Вечірній Київ (in Ukrainian). 25 Aug 1970. ^ Салій, Юлія (2017-02-17). Проект метро на Виноградар передбачає будівництво «вертикальних» тунелів [The Vynohradar metro project foresees construction of "vertical" tunnels]. Хмарочос (in Ukrainian). Retrieved 2017-07-07. ^ Віталій Кличко обговорив із топ-менеджером китайської СМЕС інвестиції у транспортну інфраструктуру Києва [Vitaliy Klychko has discussed the investments in the Kyiv's transport infrastructure with China Machinery Engineering Corporation's (CMEC) top manager]. kievcity.gov.ua (in Ukrainian). 6 July 2017. Archived from the original on 2017-07-08. Retrieved 2017-07-07. ^ За будівництво метро на Виноградар може взятися китайська CMEC - Кличко [China's CMEC can take up Vynohradar's metro construction]. Укрінформ (in Ukrainian). 6 July 2017. Retrieved 2017-07-07. ^ a b Розпорядження Київської міської державної адміністрації від 23 червня 2004 року № 1136 «Про найменування станцій метрополітену, що проектуються» [Order of Kyiv's City Government Administration nr. 1134, "On the nomenclature of underground stations in project stage", from 24 June 2004] (in Ukrainian) (published 24 Jun 2004). 29 Mar 2015. Retrieved 2017-07-07. ^ Метро на Виноградар. Потяги їздитимуть один над одним [Subway to Vynohradar. The trains will go one over another.]. espreso.tv (in Ukrainian). 17 Feb 2017. Retrieved 2017-07-07. ^ Лобко, Василь (1991). Народе мій, проснись, вставай!--поезії, публіцистичні роздуми, спогади [My nation, wake up, rise! - poems, news-style thoughts, memories] (in Ukrainian). Радянський письменник. p. 27. ^ Незабаром метро "заговорить" англійською [The underground "will speak" English soon]. Українська правда - Київ (in Ukrainian). 9 May 2012. Retrieved 2017-07-07. ^ Рішення міськвиконкому від 19.10.90 № 905 "Про повернення історичних назв, найменування та перейменування вулиць, станцій метро та нового мостового переходу в м. Києві" [Decision of city's executive committee nr. 905 "On the return of historical names, nomenclature and renaming of streets, metro stations and a new bridge in Kyiv" from 19 October 1990] (in Ukrainian). 19 Oct 1990. Retrieved 2017-07-07. ^ Рішення виконавчого комітету Київської міської ради народних депутатів № 524 "Про перейменування площі Жовтневої революції та станції метро «Площа Жовтневої революції»" від 26.08.91 [Decision of the executive committee of the Kyiv city council of people's deputees nr. 524 "On the renaming of October Revolution square and the metro station "Ploshcha Zhovtnevoi Revolutsii"" from 26 August 1991] (in Ukrainian). 26 Aug 1991. Retrieved 2017-07-07. ^ Рішення Київської міської ради №191/5578 "Про перейменування станції Київського метрополітену" від 25 травня 2011 року [Decision of Kyiv's City Council nr. 191/5578 "On the renaming of the Kiev Metro station" from 25 May 2011] (in Ukrainian). Retrieved 2017-07-07. ^ У Київраді підтримали перейменування метро "Петрівка" (in Ukrainian). Retrieved 2018-01-30. ^ "Forget Petrivka metro station – now it's Pochaina | KyivPost". KyivPost. 2018-02-08. Retrieved 2018-02-08. Wikimedia Commons has media related to Kiev Metro. This page was last edited on 13 April 2019, at 12:09 (UTC).